​Lynn Kelly is a contemporary jeweller who is based in Dunedin and Christchurch and exhibits widely in New Zealand and internationally. Lynn's work is often inspired by plants and historic botanical drawings, and her jewellery frequently uses a mixture of organic and traditional materials. Her work was represented in the 2nd, 3rd, and 4th New Zealand Jewellery Biennale Exhibitions. 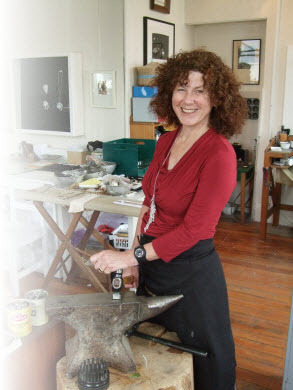 She won the Molly Morpeth Canaday Wear Aotearoa Award in 2004, the Dowse Foundation Gold Award. She received a Creative New Zealand Research grant to travel to Britain in 2008 and has had residencies in Nelson, Adelaide, Bannockburn, Central Otago Gold Award, the Caselberg Trust Creative Wilderness Residency to Dusky Sound in 2007 and Auckland Council’s residency in Scandrett Regional Park. Her work is stocked throughout New Zealand. Lynn welcomes conversations about commissions and the personalisation of her work. Please feel free to contact her for a visit at one of her workshops.